This tutorial will help you to send SMS to any registered mobile number from ESP8266. The ESP8266 is a powerful Wifi module which has been dominating the world of IOT projects. This is a Microcontroller independent tutorial meaning; you do not need any UC/UP like Arduino or PIC. We will directly program the ESP8266 module using the Arduino IDE. Once it is programmed we can send text messages from it to any pre-programmed mobile number. I am using the IFTTT Applets to accomplish this task. If you are new to ESP8266 then kindly visit the tutorials below which will help you to get started with ESP8266 and teach you how to program your ESP8266 module using the Arduino IDE. We know that the ESP8266 module can be configured both as AP or STA. Here we have configured it to work as station and have connected it to our Wifi Router. Once the connection is establish we have to find out a way to send SMS online. This online must also be easily accessible by out ESP8266 module. This is where we leverage the power of IFTTT (If This Then That) website. Using this website we can send SMS, E-mail, Whatsapp messages, Facebook updates, Twitter tweets and what not. They have a heck a lot of tools that can be used with little knowledge, but in this tutorial we are going to use the send message feature and leave the rest for other future tutorials. After few tweaks in the IFTTT website we will able to get a HTTPS URL which when triggered will send a predefined Text message to a specific mobile number. Now, this URL has to be called by our ESP8266 module when needed and your SMS will be fired to your mobile number. Sounds fairly simple right!!? Let us see the steps involved. Let us see how we can create an IFTTT Applet and get the URL for triggering the SMS to a specific mobile number. I have tried my best to explain them in steps, if you get stuck make use of the Video at the end of this tutorial. Step 1: Visit www.IFTTT.com and sign up for new ID if you don’t have one already. After registering you will be sent a mail to your E-mail ID verify it and you will be logged into IFTTTT. Step 3: Now we have configured one Applet, we will another Applet called Maker Webhooks, so search for it or use this link. Now click on “Connect” and you will get the following Screen. Step 4: Now it is time to create our own Applet that could sync both the above applets. To do this navigate to My Applets -> New Applet, or follow this link. You will taken to this page. This is a very important page. This page will show you the key and instructions on how to trigger an event. Your page will display an unique key for your ID, keep it very confidential because anyone with this key can access all your Applets. I have hidden the last five digits of my API key so that it remains confidential. Step 11: Now under “Make a Post or get web request”, you can see that we have an option to add the event name. Remember that in step 6 we created an Event named “ESP” so we have to use the same name and configure our URL like below. Once you have changed the Event name click on “Test it”. You should receive a message to your registered mobile number. In our case the message should be “The even name ESP occurred on the Maker Service. SMS sent from ESP8266 –CircuitDigest” You can configure your own SMS as per your wish. You can also send sensor values from ESP module using the value 1 and value 2 option. That is it we now have an HTTPS URL which when triggered will send a particular message to a specified number. You can copy this URL and keep it somewhere safe because we have to use this URL in our Arduino Program. You can also simply copy and paste this URL on any web browser and you can notice that the event is triggered. You will also get a reply like this shown below. Now we have to program our ESP8266 Module using the Arduino IDE. In this program we simply have to connect to the Router and call for the HTTPS URL that we just demonstrated above and then the message will be triggered by that URL. The complete program is given at the end of this tutorial but few important chunks of code which needs modification are explained below. In the above line of code, use your own Wifi Credentials in my case “BPAS home” was my Wifi signal name and “cracksun” was my password. Note: This step is very important for your code to work. The rest of the lines in the code are self explanatory anyhow if you have any doubts you can use the comment section. The video below will show you the complete working of the above discussed. /*Program to send SMS from ESP8266 via IFTTT. how to find httpsport number and host??? The invalid error key is because, you did not follow the step number 10 properly. Make sure the URL you are usig is a correct one. Simply load the URL on your browser and check if the message is received then proceed with the program. Did you ever get any response to your question: "Do you have an example that shows how to send the optional json body as described in the Webhooks setup routine. 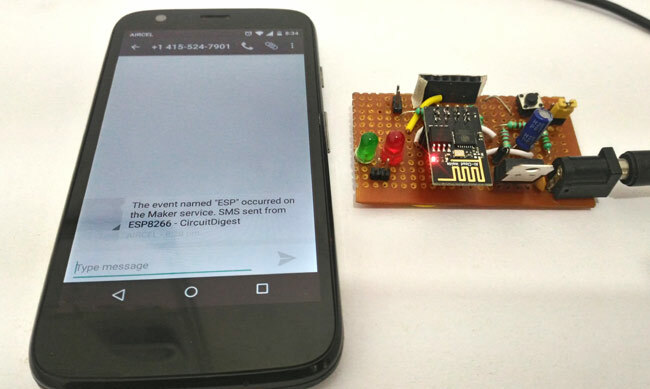 I would like to send a text on or off depending on the status of a pin on the ESP8266." Esp event fired successfully but no message came. That sounds odd. Did you give your correct number with country code? Message is coming one day late.why???? can u please tell me about using this" httpsPort = 443;" what does that mean?? When I am putting my phone number and requesting for 4 digit pin, the pin is coming one day late.As well as While Triggering the event the message is coming to my mobile one day late,why???? and prints dots forever. I'm using a Doit ESP12F Dev kit V3 (Node MCU). But how does that look in your code that uses a string to hold the URL and then builds the GET? Hi, I could not receive a PIN for my airtel no in India. Can you tell which carrier does your number belong in India? I dont think IFTTT works for Airtel in India. Thank u for this tutorial, I am working on a fall detection system. please how do i get this to trigger when a fall has been detected ? Is there anything i need to add? What command should I give to Arduino so that it should send an sms after that perticular code is executed like I want to send an sms after my flame sensor detects flame. I had the same issue with the response being <html>. The cause was a space character in the IFTTT event name. Sending text messages with no problem with only one issue. What to do to receive just one text not one every few seconds. Is it possible by modification of your program ? I have a temperature sensor. I want to send a message saying "its greater than 30 degree Celsius" when the temperature goes above 30 degrees. How do i send that information ? How is the temperature sensor interfaced with ESP. If it requires an analog pin then ESP8266 might not be a good choice. Try ESP12 or ESP32. OR if you want to send only text message, you can also use an Arduino UNO with GSM SIM900 module to send message. this applet has got a usage limit and stops working after showing a message usage limit exceeded. Thanks fir putting together this demo. It help me understand many new things. I followed your steps exactly, and the demo worked a couple of days ago but doesn't today. I wonder if either the Maker event or the IFTTT service has reached some limit and no longer works. I will try to enquire with IFTTT also. It WORKS ! but only after sucessfully uploading the code. I assumed that after uploading the SMS would be triggered whenever the ESP8266 is powered on. Do I need to do something to reset the ESP8266? I want to use this circuit to make a water level alarm which will trigger the event when a float switch detects that the water level in my basement sump has been high for a few minutes. In normal circumstances the pump starts and reduces the level before the high water level is reduced but if the pump does not operate or can't reduce the level quickly enough I need to know in order to prevent the basement flooding. I have the code for this working on an Arduino so I assume I can insert some similar code to run on the ESP8266. As others have reported, the example code no longer seems to work. Can you retest to ensure it still works with the latest github downloaded libraries? Maybe this is my internet connection issue? Maybe the port is being blocked? After much reading I think I have found a solution to the connection failed issue based on the example sketch posted here. Changes I did below. I can't say exactly which of these fixed the issue but I can confirm that it fixed the issue for me. I saw your guide, it is really invested and full of explanations and helped me a lot, well done to you !!! But the code you wrote is not suitable for this controller because you use ESP8266 as a module in itself. I would be very grateful if you could help me and tell what code I need to fit the program to Arduino uno with esp8266 module! !